What’s African about unalloyed misogyny? MP Samuel Chepkong’a, who proposed the amendment, said that when a woman got married under customary law, she understood that the marriage was open to polygamy, so no consultation was necessary, Kenya’s Daily Nation newspaper reports. Mohammed Junet, an MP representing a constituency from the western Nyanza province, agreed. This is Grade A horse manure. President Kenyatta should veto this bill. And the group of Kenyan MPs who think that disempowering women is a smart idea are advised to watch the video below of President Kibaki at a press conference ostensibly to confirm to Kenyans that he has ONLY ONE WIFE, following rumors to the contrary [More here]. Also, Mr. Kenyatta should require that before he assents to the bill it must expressly forbid dabbling in both civil and “customary” marriages because the resultant legal arbitrage only benefits men. SOMEONE TELL ME, WHY DO WE NEED A DUAL SYSTEM ANYWAY??? A woman entering a civil marriage should have the guarantee that it will always remain so, with stiff penalties for men who violate the contract. The provisions for Muslims have always been clear and should remain so. More on the unbelievably sophomoric debate on this matter in the National Assembly here. The Bill passed through its second reading in the House Wednesday, even as controversy raged over how much say women should have on their husbands’ choice to get them co-wives [?!!!???!?!??!?!?!?!?]. Although the Bill has wide ranging provisions touching on marriage, the clause on polygamy has assumed a life of its own, with debate in the House and in the public zeroing in on the controversial clause. During debate last week, the chairman of the National Assembly’s Legal Affairs Committee Mr Samuel Chepkonga said they had considered an array of opinions before the decision to introduce the amendment that may see the controversial clause deleted when the Bill comes before the Committee of the Whole House. Predictably, the reaction during debate was sharp and immediate, with mostly male MPs supporting the amendment, terming the consent clause “impractical and unrealistic” in the context of African culture [emphasis mine]. It is an interesting time as far as the institutions of governance in Kenya are concerned. The country is seeing the entrenchment of parliamentary sovereignty. Real power in the country is slowing but surely shifting from the executive to the legislature. Kudos to KBC and the parliamentary authorities for allow this to happen. I am of the humble opinion that democracy is meaningless without credible de facto (as opposed to de jure) mechanisms for horizontal accountability. Elections (vertical accountability) take place only every five years, and even then votes, in most places, are oftentimes easily bought with bags of maize and sugar. The real game remains restricted among the political elite. Democracy is only stable and productive to the extent that elites can check each other and agree to a modus vivendi. That is how democracy emerged in post civil war England. That is how it has been sustained in most of the West (even during periods of limited suffrage). And that is how it will take hold in Africa. The trick is to end the one-man-show syndrome that has characterized African politics for decades. Kenya is making that crucial transition as power sips from Ikulu to Bunge and from Harambee Avenue to Parliament Road (more on the causes soon). Let’s not kid ourselves that horizontal accountability equals democracy. It is not. But my contention is that it is better simply because the tyranny of 210 is, to me, definitely more palatable than the tyranny of 1. The Kenyan parliament today passed a law that empowers the finance minister to fix prices of “essential goods” in an effort to tame unscrupulous traders who exploit wananchi with arbitrary price hikes. That is the story the sponsors of the bill want us to believe. Trade Minister Amos Kimunya has criticized the bill as a bad signal to investors. Kenya, he said, is still committed to the principles of economic liberalization. I concur with Mr. Kimunya’s criticism of the bill. Hayek’s old wisdom about the impossibility of controlling the economy still holds; You can’t fix retail prices without also having to fix the costs of production, transportation, advertising etc. And don’t even get me started on the demerits of allowing politicians – like Finance Ministers – to have this much power over the market. The market definitely needs responsible regulation but in this instance the best way to protect wananchi, if this is the true aim of parliament, would have been to reduce the barriers of entry in the relevant industries and let competition and the invisible hand of the market drive the prices down. It is the best way to do it. President Kibaki should reject this bill. So the other day William Ruto, a prominent national leader, proposed that parliament, instead of Omondi, Kamau and Muchama, should elect the president. His rationale was that the presidency has grown into a divisive rather than a unifying figure. That Kenyans have come to view competition for the post as a do or die, as was seen earlier this year when supporters of Kibaki and Raila killed, looted and maimed in the name of their respective candidates. To some extent Ruto is right. The Kenyan presidency has been bastardized by the way the last elections were handled. It is because of the presidency that more than 1000 Kenyans died and hundreds of thousands displaced from their homes. The country is yet to fully recover from the polarizing effects of the events that followed Kivuitu’s sham of an election. So may be if we took away the winner-takes-all nature of the presidency we can reduce the risk of having another fiasco like we did in Decemeber of last year. Then we can have a very decentralized form of competition for constituency seats and then the party with the highest number of seats can form the next government. We shall in effect have a parliamentary system, with parliament having the power to recall an ill-performing president. I have nothing against the above argument. I believe that the more checks we have the better. And we can kind of tweak Ruto’s suggestion a bit to have a Premier with executive powers elected by parliament and a president with ceremonial powers – either elected by the same parliament (but with a longer tenure) or by the people (again with a longer tenure than the Premier). The only problem with this proposition is that I don’t think Kenya is ready for this yet. 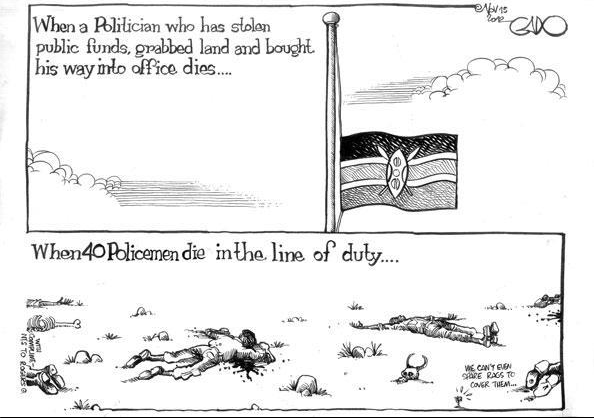 Our MPs are as corrupt as they are mindless and irresponsible. What stops them from being bribed to change governments every two days? Plus such strict parliamentary systems are highly unstable. Look at Israel and Italy for instance. They change governments every few months. This is the last thing we need in a highly tribalized young democracy like Kenya. We need stability in our politics and economic policies. Only a stable presidential system can provide this, for now. May be when we are more stable economically and have credible, stable and transparently run political parties we can flirt with the idea of having a parliamentary system. The Kenyan opposition candidate Kenneth Marende has been elected speaker of the National Assembly. This is could be a glimpse of things to come in the country’s tenth parliament where the opposition has a majority over the government. By electing their own candidate for the speaker, the opposition has proven that it has full control of the house and will challenge the government through legal means over the disputed Dec 2007 elections. The government candidate, long serving former speaker, Francis Ole Kaparo, lost by four votes. The total tally of the votes was 105 against 101.